In other news... oops. I completely forgot I was guest blogging yesterday! If you missed it (like me), go check it out at Buzzing with Ms. B. I posted about how to use nonsense words in the upper grades. Go ahead- read it, so that this post will make a little more sense. My kids LOVED when we used nonsense words, in part because I took my last name and added "ington." And somehow, when these were not just made-up words, but words from the kingdom of Garwoodington, of which I am queen, it made them so much more fun. Nonsense words don't have to be "kog" or "lat." Make them grow with the kids to reflect the unknown words that kids will face! Nonsense words are perfect for working on how to read multisyllabic words that combine digraphs, blends, prefixes, suffixes, and more. Most weeks, I use chart paper to write at least a couple of nonsense words using our phonics pattern of the week, but nonsense words are also a great way to work on context clues and vocabulary skills. Every once in awhile, I throw in a REAL word, too- and after they sound it out and figure out from context clues what it means, I surprise them by saying it's a real word. They love knowing that they just 'discovered' a new word and didn't even have to look it up! 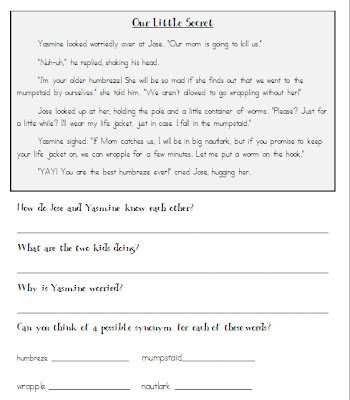 In this freebie, I've included a short answer page, and then a short story with some comprehension questions and *four* nonsense words. I've even included one real word so you can surprise your class! Pick up your freebie copy here and write in your own "kingdom" name! 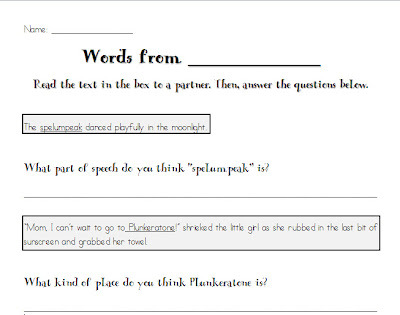 I love using nonsense words because students think they're fun, but I can teach many valuable, authentic skills that ALSO apply to tests! Do any of you do things like this? Would you like to see more? P.S. -- If you thought the "scubba" in my guest post was the word "cheesy"... you're right! :) Yayyyy! P.P.S. 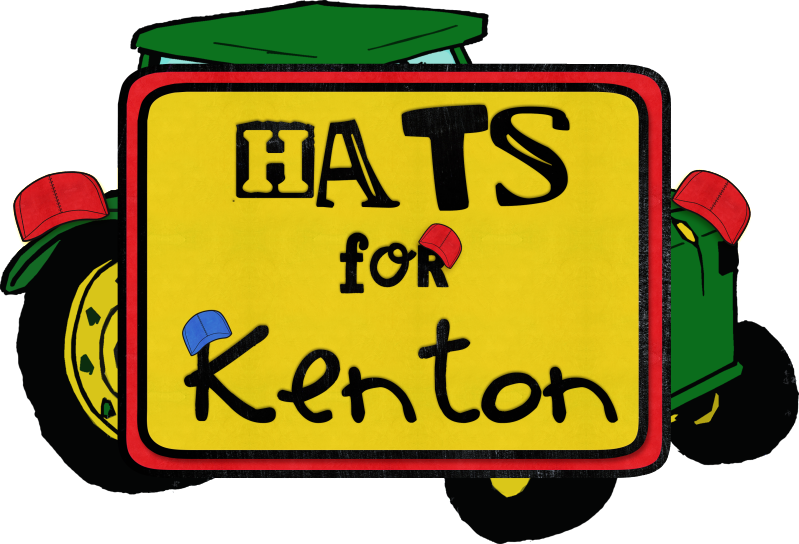 -- Did you catch my post about Hats for Kenton? Don't forget to sign up to help us cheer up a boy with leukemia (and his family!). And please help me spread the word on your blog, if you have one! I love your idea to use nonsense words to teach context clues! Great idea!!! There's a great book called Henry P. Baloney that uses nonsense words and is also great for teaching context clues! It's about a cute little alien who is late for school and gives his teachers a silly excuse. It's always a hit with my kiddos! :) Thanks for the freebie!!!!!!! !